MIOS Studio 2 is a Juce based, platform-independent MIDI processing environment which allows to upload an application binary to a MIOS8, STM32F1, STM32F4 and LPC17 core. 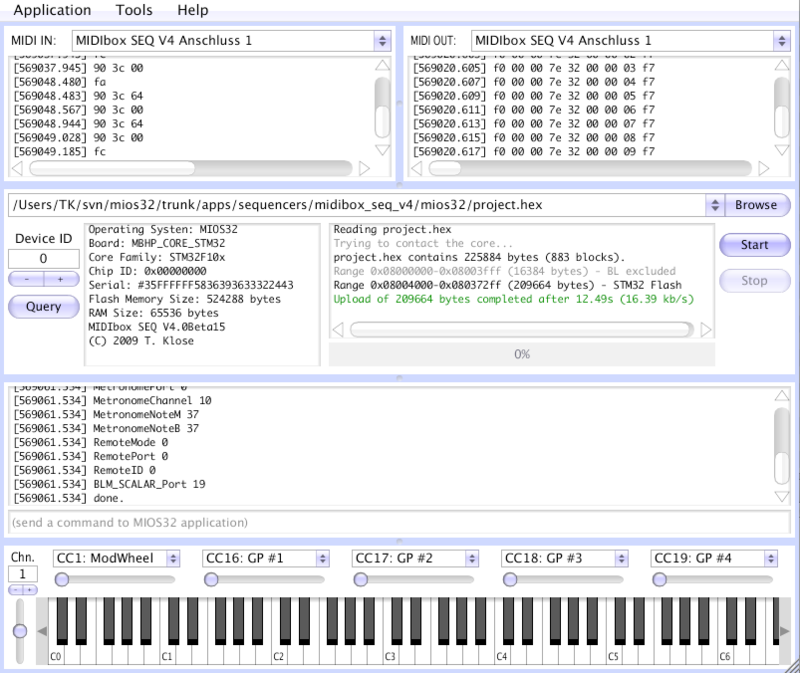 It also provides MIDI monitors, a virtual MIDI keyboard, a terminal to communicate with MIOS32 applications (partly also used by MIOS8 applications), a SysEx transfer tool and configuration tools for MIDIO128 and MIDIbox CV V1, a SysEx Librarian and a Filebrowser. MIOS Studio will automatically try to contact the core whenever a new MIDI port has been selected, and determine the run state. The detected application will be displayed in the query window. Select the .hex file you want to upload by pressing the browser button (3). Thereafter press the start button to upload the binary (4). DONE! - if the upload should fail, please continue at the MIDI troubleshooting guide. 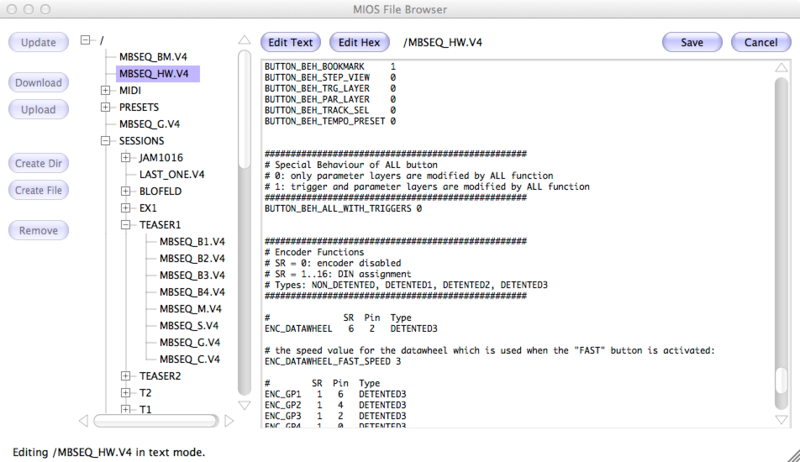 The MIOS Terminal is a very helpful debugging tool for MIOS32 applications. 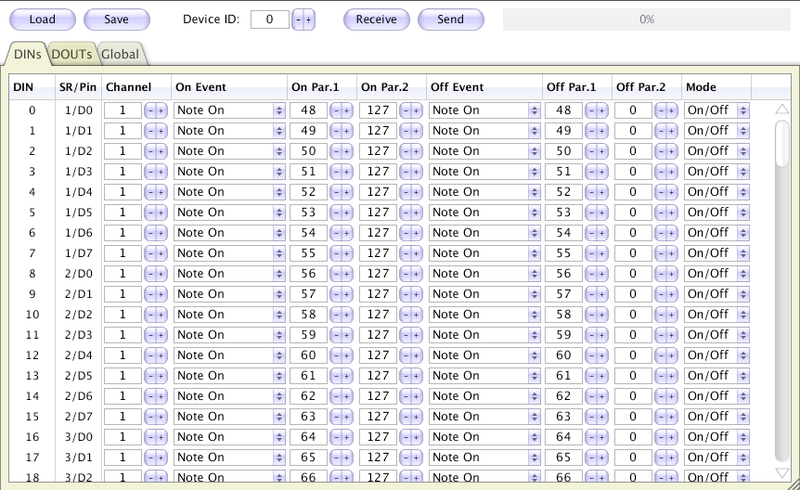 It displays strings which are sent with the MIOS32_MIDI_SendDebugMessage or MIOS32_MIDI_SendDebugHexDump function. Note: MIOS8 won't respond to a command string sent to the PIC microcontroller. This feature is provided by MIOS32 only! 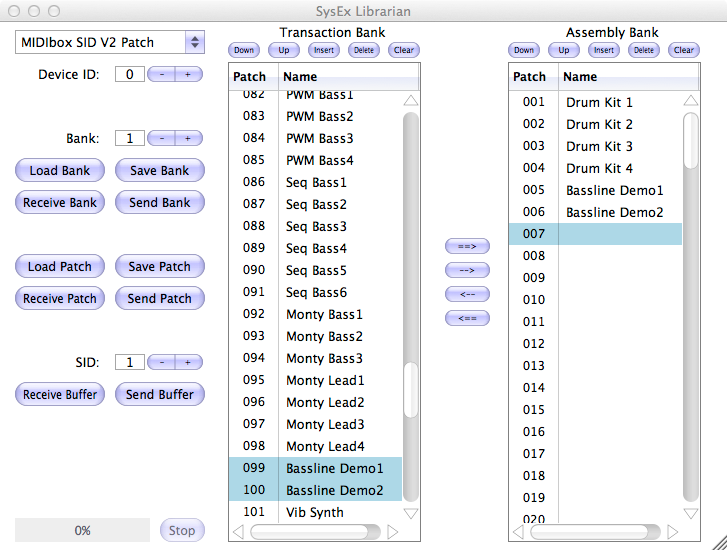 for handling MIDIbox SID patches correctly, you need firmware version v2.041 or higher! for handling MIDIbox 808/Dr patches correctly, you need firmware version v1.3 or higher! 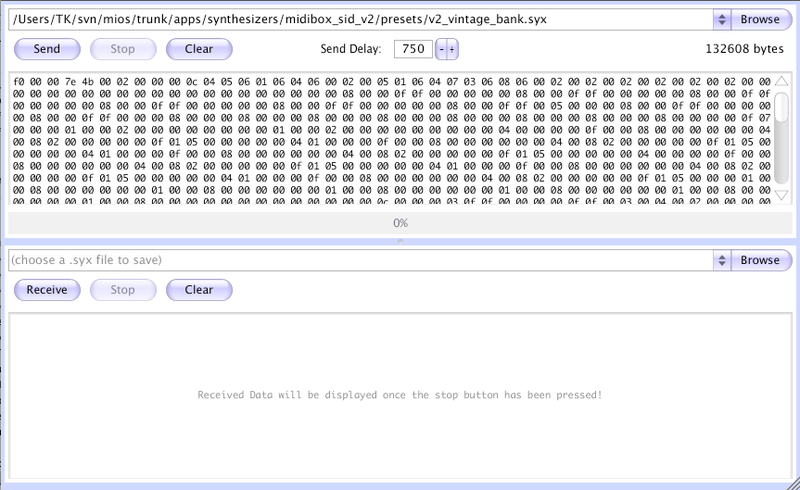 Similar to the SysEx window, there is one frame to enter data that should be sent, and another frame which displays received messages. Enter the remote host and port over which datagrams should be sent. You can either enter the IP address or the host name of the host that should receive outgoing data (such as "localhost" to send data internally on your PC/Mac). 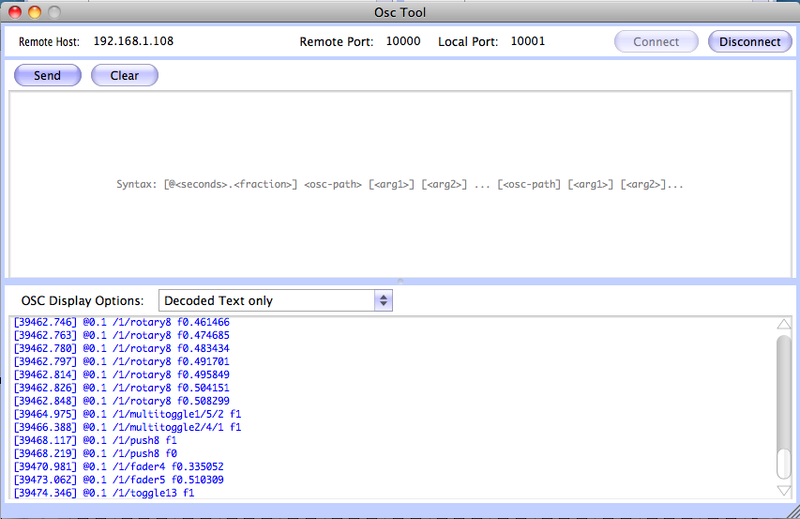 The local port is the one which receives OSC datagrams from any IP. It's allowed to set the local port to the same number as the remote port if your application requires this. E.g., by setting remote host to "localhost", and both ports (remote and local) to "10000", outgoing datagrams will be received like on a loopback. The send window supports multiple OSC messages sent in a bundle. The syntax for entering datagrams is the same as displayed by the receive window. Here some examples. To improve the readability, we always take /foo/bar as the free definable path, and we leave out the timestamp (which can optionally be specified by writing @<seconds>.<fraction> before the path. /foo/bar sHello! sends the string "Hello!" /foo/bar SHello! sends the alternate string "Hello!" /foo/bar [ sends "Beginning of Array"
/foo/bar ] sends "End of Array"
It's for example supported by MIDIbox SEQ, MIDIO128, MIDIbox NG, and by all future applications which get use of a SD Card to store informations. --upload_hex=     upload specified .hex file to core. Multiple --upload_hex allowed! --upload_file=    upload specified file to SD Card. Multiple --upload_file allowed! --send_syx=       send specified .syx file to core. Multiple --send_syx allowed! --terminal=    send a MIOS terminal command. Multiple --terminal allowed! --wait=        Waits for the given seconds. Most parameters can be combined to a sequence of operations. E.g. upload a .hex file, upload files to SD Card, execute a terminal command and wait some seconds before exit. Use quotes if strings have to be specified which include spaces (e.g. terminal commands or MIDI IN/OUT ports). By entering these aliases into your ~/.bash_profile, they will be available whenever a new terminal is opened. Firstly it should be highlighted, that the Juce based MIOS Studio 2 solved all MIDI uploading issues of V1 which were mainly related to the MIDI API of Java implemented by Sun and Apple (or third party vendors)! Windows7 64bit: the SysEx communication gets stucked if a MIOS32 core opens more than one USB port (like MIDIbox SEQ V4). Workarounds ensure that your are using MIOS32 Bootloader V1.010 or higher, and install the GM5 device driver. Alternatively you could install the Korg USB driver as reported here, but the GM5 driver seems to be better.